Yep, you read that right. Luck. To me, luck occurs when a positive and fairly unexpected event happens in your life, whether it be financial or otherwise. Thus, improving your luck means increasing the chances of such positive events happening – and also increasing the chances that you’ll be able to take advantage of them. In other words, there’s nothing supernatural about it. 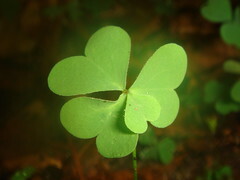 No hoping, no holding four leaf clovers in your pocket, no rabbit’s foot or lucky coin. No “think and it will happen” Secret nonsense. Just preparation, nothing more, nothing less. Here are ten things you can do to make yourself more lucky. Writing down creative ideas for your work, whether freelance or otherwise. People ask how I am consistently able to come up with ideas. The real secret isn’t creative bursts, it’s that whenever I have an idea cross my mind, I jot it down. It might be at the park or in the grocery store or at two in the morning when I’m awakened by my son’s cries after a bad dream. The key is to jot them down and not lose them. Writing down information you learn from others. You’re chatting with a buddy and he tells you where you can get a great deal on big water bottles because you’re getting into home brewing. Instead of trying to remember what he said when you get home, just yank out your notebook and jot it down. Not only will it help you remember, it can also flatter your friend if you do it right – say, “Really? Wow… I need to remember that one!” then pull out the notebook, jot it down, and then say “Thanks!” They’ll feel as though you thought their idea was really important (which it was). Writing down prices. You’re shopping at Sam’s Club and observe what seems like a really cheap price on bulk fruit juice, but you’re not sure if you can use that much or exactly how good of a deal that is. Write down the price and the quantity now, then do the research later. You might just find yourself saving quite a bit of money. Getting out of pinches. If you run out of gas in the country, no amount of plastic will help, but a $5 bill at a farmhouse door might get you that gallon of gas you need to get into a nearby town and fill up. Buying items at deep discounts. Several months ago, I bumped into a friend who was trying to get rid of an old PC. It was in fine condition and was fairly modern, except the hard drive was on the fritz and he didn’t want to deal with it. $10 later, I had a new PC. A $50 hard drive later, I was able to resell the whole system for about $200 and about thirty minutes’ work. That would have never happened without the $10 in my pocket. Helping others. See tip #6 for more on this, but quite often having a $20 bill in your pocket when a friend is in a pinch can make all the difference. Helping out a friend when they really need it – and often a bit of cash can do just that – will pay back huge dividends later on, whether you notice it or not. Spend less than you earn. Spending more than you earn means accumulating debt. Spending less than you earn means removing debt and, eventually, building up savings. Guess which one’s better in the long term – and more likely to open up doors for you? Remember that the next time you blow cash without a good reason. Make a debt repayment plan – and stick to it. It’s not as hard as it sounds: identify your debts and start paying them off in a logical order by making extra payments on one at a time until they’re all gone. Don’t revert to overspending when your debt is under control. Instead, start saving it. Set up an automatic savings plan with your bank so that the money isn’t even there to tempt you. Keep it out of sight until you need it for a specific purpose. Most useful opportunities come about as a result of knowing other people and engaging in social opportunities. Being involved in these kinds of situations can open you up to all sorts of new ideas and new opportunities. This can be difficult, particularly if you’re the type of person who isn’t exactly extroverted. Nevertheless, here are some tactics you can try. Make an effort to get to know the people around you. The best place to start is with people you see on a daily basis already. Your neighbors. People who work in your building. People you don’t know well that are part of your social group. Take some time to get to know these people. Talk to them. Ask what their interests are. Invite them to do something socially with you. Join social groups – and take leadership positions. Your community is loaded with opportunities to meet people. Dig through the community calendar and find groups that are at work already in your community. Try out ones of interest, then get involved in ones that pique your interest even more. Don’t be afraid to step up and take leadership positions – that way, you can really get to know some of the people involved. Don’t sit back and be quiet in group situations. When you are in social situations, don’t be a wallflower. Participate in the conversation and don’t be afraid to let your voice be heard. If you have an idea in your head, put it out there – even if it’s not the strongest idea, it’ll likely still spur on the conversation and help you build a connection with everyone involved. That’s far better than keeping it inside. If you’re already passionate about the topic, finding and connecting with others passionate about that topic can help you in countless ways. You can tap into their knowledge on the topic, share your own ideas and experiences, and often share things outside of this interest area. Here are some tactics for getting started. Be an active participant in organizations that match your interests. If you like to read, join a book club and participate actively. If you like to play board games, see if there are any board gaming groups in your area and get involved. The people in these groups already share a passion that you do, so you’ve already got something in common with them. Plus, it’s quite likely that these people will have access to some incredible insights and bargains in your interest area. Make an extra effort to reach out to people who you’ve identified as having an interest overlap. If you happen to meet someone casually who has an interest overlap with you, jump on board with that connection. It can provide a great opportunity for you to build a friendship in an unexpected place. Share your skills, ideas, and knowledge freely with others, particularly newcomers. If you’re already involved in a group with a particular interest, make an effort to outreach to new people who might stop in. Not only will a friendly face help to encourage them to get involved, they’ll often associate you with a very positive light, as you’re the one who broke down some of that “new” barrier for them. Similarly, when people come to such meetings looking for help, don’t hesitate to offer what help you can provide. Luck often comes around in the form of help when you need it, and the best way to “grease the rails” for help when you’ll eventually need it is by helping others out now. If you’re presented with an opportunity to help – particularly one that you can fulfill without infringing on your other responsibilities – the luckiest thing you can possibly do is help with all you can. Share your time and resources whenever you can. Always be willing to offer up your help when an opportunity comes along. Give it willingly, without condition – just jump in and help out. The sheer enjoyment of being helpful to others is enough, but when you consider that good deeds often come around in unexpected ways, one kind and helpful hand can provide more “luck” to you than you might ever know. Build connections that people need. If you know someone who can easily solve a problem someone else is facing, make that connection quickly and immediately. Don’t hesitate to call in a favor, either. Make it happen and you’ll not only help someone, but you’ll help build a relationship between two people who can help each other out. Don’t expect something in return. When you help others, don’t expect something in return. Instead, just enjoy the experience of helping that person out and the stronger relationship you’re building. That stronger relationship will be there for you later on in your time of need – just trust it and be a helpful friend whenever you can. Enough about building relationships – where can I get “lucky” deals? The best place to look is off the beaten path – you’re not going to find a great bargain at the local boutique shop. Avoid “high-end” shops like the plague. “High-end” shops, like the ones littering your local mall, rarely have true bargains. Even the sale items are usually overpriced. Instead, spend your time looking for truly amazing deals elsewhere and avoid that upscale mall (the home of whatever the opposite of luck is) like the plague. Hit yard sales, consignment shops, local “miscellany” shops, and other bargain basement places regularly. If you’re going out to shop, don’t head straight for the local chain store. Instead, focus on places where you can find huge “lucky” deals – yard sales, consignment shops, and so on. Look at Craigslist and Freecycle. Just keep tabs on these by browsing the new entries regularly. You can often find insane deals if you pay attention to these. I’ve acquired tons of free books and new computer equipment for free, and I picked up a huge Apple Store discount just by asking. Having a diversity of skills and experiences under your belt can often open amazing and unexpected doors for you. Being able to step up and say, “I can do that, I’ve done it before” can result in all kinds of “lucky” experiences. Here’s how to dig in. Try new activities regularly. Don’t just fill your day with the same old routines. Try new activities, particularly ones that stretch your skill and also might be useful to others. Learn how to do lots of home repair tasks. Learn how to do basic maintenance on your car. Know the basics of playing a lot of different sports and games, particularly card games that you might get a chance to play socially. Read a wide variety of books. Listen to a variety of music. Travel to interesting places. These will all teach you new things and get your foot in the door in certain situations. Push the limits of what you think you can do. Don’t shrink back from a challenge. Take it on. If you fail, so what? You’ll learn something new from that failure, too. You’ll discover only success from the effort put into pushing yourself, and those new limits can open “lucky” doors for you. Make friends that encourage you to try new things, not discourage you. I’m incredibly lucky in that my best (non-spousal) friend constantly encourages me to try new things. He was one of the earliest encouragers of my work on The Simple Dollar and he’s never been negative towards anything I’ve wanted to try, always positive. Because of that subtle encouragement, I’ve been much more willing to try new things in my own life. The stories you hear of people buying something for fifty cents and transforming it into something quite valuable, often reselling it for a bundle, often occur because a person is rather knowledgeable about a particular area and the value of items in it. If you have a particular area of interest, just knowing the value of items in that particular area of interest can pay huge dividends. Keep up with your area of specialty. My area of specialty is trading cards, particularly sports cards and collectible card games. I keep pretty close tabs on going rates for items in this specialty – I browse eBay all the time and leaf through hobby publications in this area. This keeps me pretty up to date about what’s going on in those areas. Keep an eye out for such items outside of their specialty area. For this hobby, that means junk stores in rural towns. If I’m in a smaller town or city and I spot an old coin shop or a junk store, I’ll always stop in and look around. The stuff you can find in there is amazing, and it’s for reasons like this why I ardently follow tip #2 (keeping cash on hand). I’ve purchased sealed packages of cards for a dollar a pop in these stores and sold them for over $100 a pop just a few weeks later. Identify places that often have wildly mispriced items. The best place to look are huge consignment shops and outlet shops where there are tons and tons of items for sale. For example, a year ago I mentioned an article in The New Yorker that discussed a store chain in Nova Scotia called Frenchy’s that basically consisted of huge bins of unsorted clothing bought in bulk. If people dug through these bins, they were finding patent leather boots with high heels for just a few dollars. Similarly, I’ve bought amazing sweaters and Nike crosstrainer shoes for just a few bucks by going to overstocked outlet stores. When you’re thinking of making a big purchase, instead of just heading out to the store or even just doing research, hit your social network that you’ve been crafting and see what sort of “luck” befalls you. Here’s how. Keep tabs on any good “inside deals” that a friend might be able to get for you. I have a friend of a friend who works at the Apple Store and has gotten me some significant discounts on items. Similarly, another friend works for a particular electronics chain and has offered to get me 50% off a flat panel television if we ever decide to upgrade. Yet another friend works for an appliance manufacturer and has offered to help us get a great deal on our next washer and dryer (especially timely, since our washer is on the fritz). Whenever I hear about one of these deals, I jot them down so I remember them later when I need them (yes, in my notebook mentioned earlier). Ask around for suggestions on a purchase. Whenever I look at a big purchase, I not only do my own research, but I call around and ask friends about their similar purchases. Not only does it provide a great conversation opener, I usually learn a lot about the products out there. It can often lead into great bargains as well, as it gives a great opportunity for friends to offer up good “inside deals” that they know about. Ask around for bargains on a more specific purchase. If you know the exact item you’re buying, that’s another time to hit the social network. Tell people that you’re looking at buying this specific item and ask them where they’d buy it. This again gives your network the opportunity to push you in the right direction with a purchase. Here’s the long and short of it: build friendships, give freely of yourself, and put yourself in situations where you can take advantage of opportunities. That’s what luck is really made of – putting yourself in positions where opportunities simply pop up instead of just waiting for them to come along.